Once again, it's all behind me. I can't believe I have to wait another year to run the Walt Disney World Marathon. A year! A WHOLE YEAR! How am I supposed to enjoy life when I know that I could be enjoying it much more if only I were limping through the ESPN Wide World Of Sports?! On a more serious note, I touched on this a bit via Twitter, but I wanted to extend my heartfelt thanks to the TSA and air traffic controllers for working for no pay during the furlough. 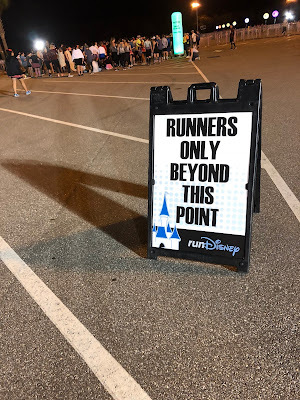 My little heart longs for the WDW Marathon, and if I couldn't go, I would be crushed. Thanks to the TSA, I was able to fly there and back and all my dreams came true. A sincere thank you to all of you! I hope you get some frickin' money already. Headed down to Baltimore to prep for leaving for WDW in the morning! Trip recap to come, of course! The roundup is as serious as you want it to be. - Black Dog Runs Disney knows what to look for in a race. - WDW For Grownups checks out one of WDW's workout facility options. - Jambo Everyone plays defense for my beloved Disney's Animal Kingdom. - Main Street Gazette understands the vast importance of WDW background music. - Disney In Your Day has brunch at the California Grill. - Living A Disney Life explores the small joys of WDW. Can't wait for the trip report!